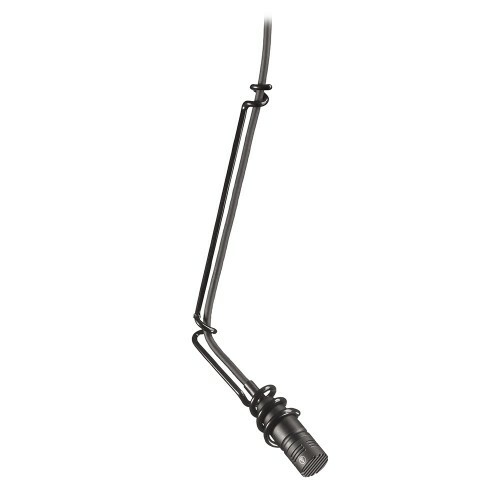 Maintaining the Audio-Technica tradition of clear and transparent sound quality, the U853A cardioid condenser hanging microphone is ideal for speech, theater, orchestra and choir sound reinforcement and recording. The microphone’s fast transient response and low distortion characteristics allow every complex detail to be heard with all its impact-rich, vibrant qualities faithfully reproduced. Equipped with UniGuard® innovations that offer unsurpassed immunity from radio frequency interference, the U853A accepts interchangeable elements, available in cardioid, hypercardioid, omnidirectional and UniLine® line cardioid polar patterns. The battery or phantom powered microphone also offers an 80 Hz low-cut UniSteep® filter that reduces pickup of low-frequency ambient noise. Phantom: 133 dB, 1 kHz at 1% T.H.D. – Battery: 123 dB SPL, 1 kHz at 1% T.H.D.